After graduating from George Mason, I went to Carleton College in Northfield, Minnesota, where I majored in astronomy (a very cold 4 years).A� In 1964 I returned to Falls Church and began working for the U.S. Naval Observatory Time Service in Washington, D.C. A� Dennis McCarthy, also an astronomer, came there to work in March 1965.A� We married in 1966 and I a�?retireda�? in 1968 when our son, Duncan, was born.A� Our daughter, Deidre, was born in 1972.A� In 1975 we moved to Vienna where we still live.A� In 1983 I returned to work full time for INTELSAT (International Telecommunication Satellite Organization) in the Antennas and Propagation R&D group.A� I continued to work there through 1994.A� INTELSAT had decided to change the direction of the company by offering an early retirement with immediate pension to all those 50 years or older.A� I was near the end of my projects, Duncan and Deidre had finished college, and my mother was struggling with dementia, so I retired again.A� My mother died in July 1996.A� Dennisa��s father who had lung cancer died in March 1997.A� His mother, suffering from dementia, died in January 2003 after we moved her here from their home town of Oil City, PA.
Dennis belongs to the International Astronomical Union and the International Union of Geodesy and Geophysics. His work has sent him abroad many times.A� The children and I accompanied him often.A� Dennis retired from the Observatory in 2005, but has been rehired part time.A� We continue to enjoy international travel for business and on our own.A� Duncan works for NGA (National Geospatial-Intelligence Agency) and Deidre works for the National Park Service in the Cultural Resources Group.A� Deidre and her boyfriend live across the street from us.A� Deidre developed Multiple Sclerosis in 2000, but is doing well.A� Duncan also lives in Vienna.A� We all see each other often. 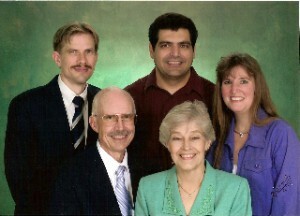 We are active in Wesley United Methodist Church in Vienna.A� I began teaching ballroom dancing for the Fairfax County Park Authority in 1994, a continuation of my teaching for Foxes School of Music and Dance (now Foxes Music Company) in Falls Church while in high school.A� I belong to Chapter K of the P.E.O. Sisterhood.A� We got a 32a�� sailboat in 2005 which is moored at Solomons Island.A� We are so busy I cana��t imagine how I had time to work full time.